Spanish designer Jaime Hayón is launching a limited-edition chronograph with a chimp-like face for his watch company Orolog. 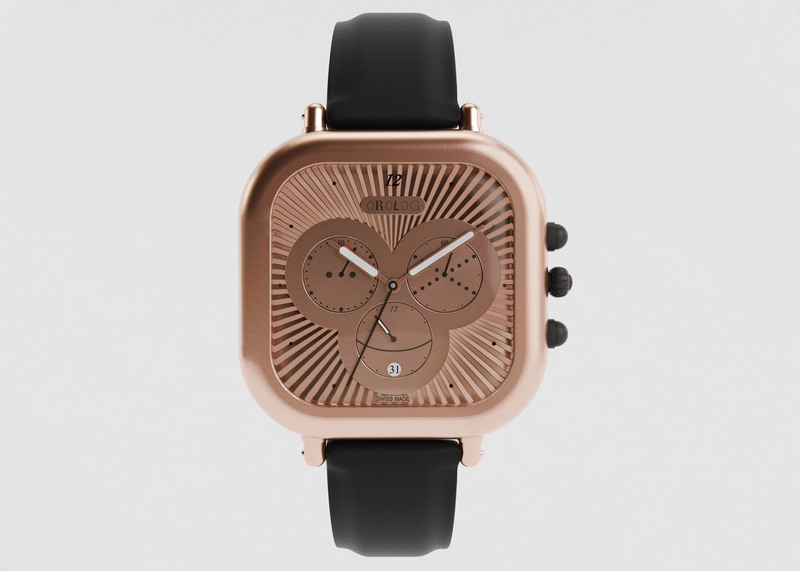 Miko, the first watch in Hayón's Play Time series, features a rectangular stainless steel casing with rounded corners. The new model is set to launch at watch fair SalonQP in London next week. A trio of conjoined circles on the face are arranged to resemble the facial features of a monkey, with graphical elements added to emphasise this. It echoes the forms of Hayón's first Orolog watch design, which also featured a face with three circular elements, and is available in Dezeen's Watch Store. The designer has previously used the shapes monkeys to create a concrete side table and a set of mirrors. "Monkeys are interesting, I've used them before in porcelain," Hayón told Dezeen. "I thought why not integrate that into a watch?" This latest watch design was previewed as part of his Game On solo exhibition at Galerie Kreo in Paris earlier this year. The surface of the watch is ridged, creating lines that radiate out from the centre of the face. The timepiece is available as only 50 editions and comes in grey, black and rose gold versions. "My idea of designing watches is that I always wanted to make something that looks beautiful and is nice to wear," said Hayón, who has also designed lighting for Metalarte and furniture for Magis. "This is how I started designing these, trying to make something that I'm really pleased with and would be happy to wear all my life," he added. "What I have discovered by making watches is that I really enjoy making them," said Hayón. "A part of that is also a very beautiful kind of focused type of design, it's very different from designing interiors or making installations or creating furniture." "There's a lot of micro things happening in there, like a button, it's something quite amazing," he added. "Its a small thing but it has a lot of detail and elements to it, that makes the design very sophisticated." "All that comes together in the watch, and I thought it was interesting to bring something very animalistic. Thats why I used the monkey, the idea of having a glimpse of humour in something very technological and technical." SalonQ will take place from 12 to 14 November 2015 at London's Saatchi Gallery. Products by designer Marc Newson and silverware brand Georg Jensen are also due to launch at the event.